After the long-dormant supervolcano Campi Flegrei awakened late last year, a team of scientists that has pinpointed the now-active volcano's magma source says a potentially devastating eruption could be just around the corner. Campi Flegrei is a volcanic caldera to the west of Naples that last erupted in the sixteenth century. It has been mostly quiet since then, with the exception of a few small tremors in the 1980s. Seismographic data from those rumbles allowed scientists to pinpoint the source of the magma that flooded into Campi Flegrei's chamber and caldera, according to United Press International. The results are unequivocal: An analysis of the supervolcano's hot zone suggests Campi Flegrei could be nearing an eruption. "What this means in terms of the scale of any future eruption we cannot say, but there is no doubt that the volcano is becoming more dangerous," De Siena said. Researchers liken the volcano's hot zone to a boiling pot of soup. Over the last several years, the volcano has gotten considerably hotter. Four years ago, scientists warned any eruption could kill millions living near or on top of the volcano. "These areas can give rise to the only eruptions that can have global catastrophic effects comparable to major meteorite impacts," said Giuseppe De Natale, head of a project to monitor the volcano's activity. Now, based on an assessment of the current flows, scientists are worried that a potentially deadly eruption could happen close to a population center like the city of Naples. "During the last 30 years the behaviour of the volcano has changed, with everything becoming hotter due to fluids permeating the entire caldera," Dr De Siena explained. "Whatever produced the activity under Pozzuoli in the 1980s has migrated somewhere else, so the danger doesn't just lie in the same spot, it could now be much nearer to Naples which is more densely populated. "What this means in terms of the scale of any future eruption we cannot say, but there is no doubt that the volcano is becoming more dangerous. The study, which Phys.org reports provides a benchmark that could help determine the timing of future eruptions, was led by Dr. Luca De Siena at the University of Aberdeen in conjunction with the INGV Osservatorio Vesuviano, the RISSC lab of the University of Naples, and the University of Texas at Austin. Still, scientists have some questions. 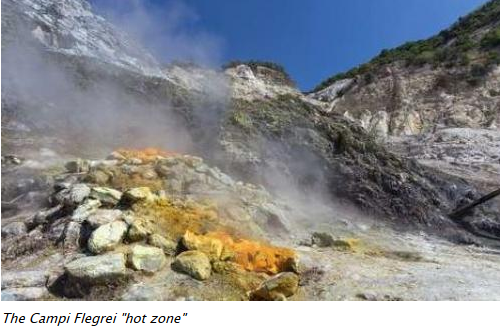 "One question that has puzzled scientists is where magma is located beneath the caldera, and our study provides the first evidence of a hot zone under the city of Pozzuoli that extends into the sea at a depth of 4 km," Dr De Siena said. Dr De Siena's study suggests that magma was prevented from rising to the surface in the 1980s by the presence of a one-to-two-kilometer-deep rock formation that blocked its path, forcing it to release energy along a different route. While the implications of this are still not fully understood, the relatively low amount of seismic activity in the area since the 1980s suggests that pressure is building within the caldera, raising the risk of an eruption. Just days ago, scientists warned that Mount Paektu, a long dormant supervolcano in North Korea, could be roused to a potentially humanity-threatening eruption if the isolated nation continues to conduct nuclear tests at its Punggye-ri nuclear test site. Meanwhile, US government officials are monitoring a similar situation unfolding at the Yellowstone Caldera in Wyoming, another “supervolcano.” An eruption at Yellowstone could plunge the Earth into a volcanic winter, according to scientists at NASA, who’ve devised an incredibly risky plan to save the US from the volcano. Of course, some scientists say NASA’s plan risks triggering the eruption it's trying to prevent. NASA believes the most viable solution could be to drill up to 10km down into the super volcano and pump down water at high pressure. The circulating water would return at a temperature of around 350C (662F), thus slowly day by day extracting heat from the volcano. And while such a project would come at an estimated cost of around $3.46 billion, it comes with an enticing catch which could convince politicians (taxpayers) to make the investment. Of course, drilling into a supervolcano comes with its own risks, like the eruption that scientists are desperate to prevent.